The Westphalian, or Westfalen, is a warmblood horse. Since World War II, the Westphalian horse has been bred to the same standard as the other German warmbloods, and they are particularly famous as Olympic-level show jumpers and dressage horses. Next to the Hanoverian, the Westphalian studbook has the largest breeding population of any warmblood in Germany. The Oldenburg is a warmblood horse from the north-western corner of Lower Saxony, what was formerly the Grand Duchy of Oldenburg. The breed was built on a mare base of all-purpose farm and carriage horses, today called the Alt-Oldenburger. 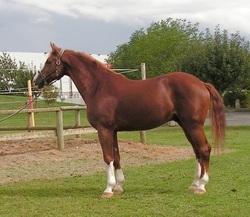 The modern Oldenburg is managed by the Association of Breeders of the Oldenburger Horse, which enacts strict selection of breeding stock to ensure that each generation is better than the last. 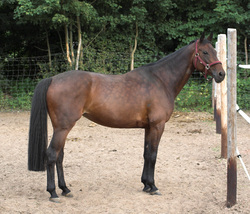 Oldenburgers are tallsport horses with excellent gaits and jumping ability. The breeding of Oldenburg horses is characterized by very liberal pedigree requirements and the exclusive use of privately-owned stallions rather than centralization around a state-owned stud farm.